FLASHBACK! 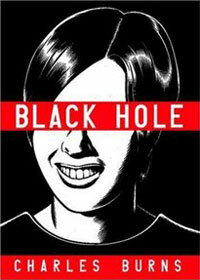 Recently our podcast covered Charles Burns’ Black Hole for the second time. So what did the first time sound like? Here it is, featuring Tim and Brandon. In the style of the early episodes, we spend part of the show analyzing Burns’ book through the lens of Scott McCloud’s Making Comics, chapter three: The Power of Words. In Black Hole, Charles Burns examined coming of age, in a new and slightly creepy way. After losing their virginity, various teens are affected by something called The Bug. Does The Bug symbolize puberty, or something else? Kumar and Dana go back to take another look at this classic graphic novel.